These are some of our catering options, special requests are always welcome! Organic mixed greens with cucumbers, tomatoes, red onions and sliced colored sweet peppers. Served with choice of dressing. Organic baby spinach, cherry tomatoes, apples, walnuts, crumbled bacon, and crumbled bleu cheese. Served with balsamic dressing. Shell pasta baked in a cheese sauce made with cheddar, Swiss and provolone cheeses, topped off with Parmesan cheese and bread crumbs. Thinly sliced chicken breasts, lightly floured and sautéed in butter. Served with a Marsalla wine sauce with fresh baby Portobello mushrooms shallots and parsley. Thinly sliced chicken breasts, lightly floured and browned in butter, served with a lemon and white wine sauce, with capers and tomatoes. Southwestern marinated chicken breast, served sliced over seasoned black beans and grilled peppers and onions. Marinated chicken legs and thighs. Choice of marinade: Asian, Fresh herbs with lemon and garlic, Southwestern. Salmon filets served roasted or poached with a yogurt and dill sauce. Traditional Meat Lasagna with ground beef, Italian pork sausage and pepperoni with layers of pasta, ricotta, mozzarella and parmesan cheese and tomato sauce. with sautéed mushrooms, spinach, bell peppers, zucchini, onions and garlic with layers of pasta, ricotta, mozzarella, parmesan cheese and tomato sauce. Penne pasta with mixed fresh veggies in a garlic, butter and fresh herb sauce. Roasted mixed veggies served over sautéed quinoa with onions and garlic and a side of balsamic vinaigrette. Roasted red potatoes with onions and bell peppers, fresh herbs and garlic. Cheesecake - 10 inch plain with graham cracker crust, chocolate with chocolate cookie crust, or pumpkin with ginger snap crust. With Rum Eggnog with a ginger nutmeg crust. Rum bundt cake soaked in rum syrup and topped with crushed walnuts and a rum glaze. 9x 13 Tray of chocolate brownies. Cut into 8 jumbo, 16 small or 32 bite size. 1 dz (2 oz) cookies- Chocolate chip, oatmeal raisin, peanut butter, double chocolate chip. Hand decorated sugar cookies, super cookies (oatmeal cookie with chocolate chips, dried fruit, coconut and nuts), coconut macaroons, hand decorated gingerbread cookies. 24 regular or 12 jumbo iced and decorated cupcakes. Choices of cake - vanilla, chocolate, red velvet, spice, lemon. Choices of icing - vanilla, chocolate, fresh berry, peanut butter, cream cheese. Add a liquor flavoring - rum, baileys, limoncello, tequila. $1 each cupcake. 10 inch layer cake. Choice of cake - vanilla, chocolate, red velvet, spice, lemon. Choice of Icing - vanilla, chocolate, cream cheese, fresh berry. Warm brie cheese melted on toasted Baguette slices, topped with a fresh sliced strawberry, grape, apple or fig puree and a balsamic and pink peppercorn reduction, topped with a toasted pecan. 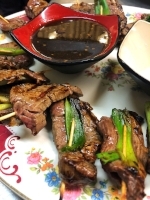 Sliced beef tenderloin wrapped with scallions skewered and grilled, served with a sweet and spicy Asian dipping sauce. 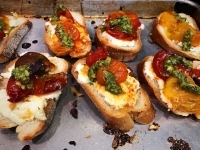 Coach Farm Goat Cheese on toasted crostini with roasted cherry tomatoes and garlic, topped with fresh basil. Homemade devilled eggs topped with smoked salmon and fresh dill, or bacon and pickled jalapenos. Traditional tomato, watermelon and cilantro, or honeydew and ginger gazpacho served chilled in shot glasses. fresh Black Sheep Hill ground pork, scallions, ginger and garlic, topped with sweet and spicy sauce. fresh ground lamb, feta cheese, spinach, roasted red peppers onion and garlic. fresh ground beef, bell peppers, red onion, cilantro and fresh corn topped with pepper jack cheese. Curry Chicken salad with white meat chicken, cherry tomatoes, grapes, onion and fresh apples served in fresh crisp endive leaves. Black bean and fresh local corn, bell peppers, red onion, fresh cilantro and lime vinaigrette served in bite size tortilla cups. Flaked smoked trout, served on soda crackers with Ronny Brook crème fraiche, cranberry and horseradish jam and fresh chives. Pesto marinated shrimp grilled and served on a skewer with a fresh cherry tomato. Smoked salmon, cucumber, dill cream cheese and capers served on toast points. Marinated mozzarella cheese, Kalamata olives, cherry tomatoes and salami on skewers. Thin sliced prosciutto wrapped around cantaloupe, or honeydew melon with fresh peppery arugula. Seared Ahi Tuna on a rice crisp cracker with pickled ginger, wasabi cream, avocado and black sesame seeds.